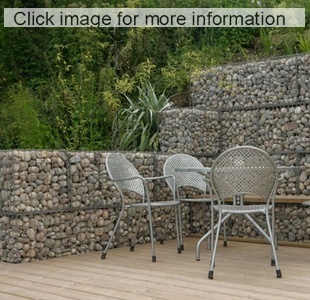 If you’re looking to build decorative stone walls, to have flat areas for patios and lawns, gabions are a low cost diy stone wall for your garden. 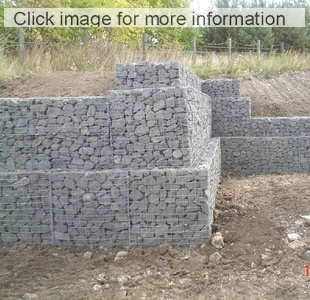 Building a stone wall with gabions keeps the stone wall cost down. 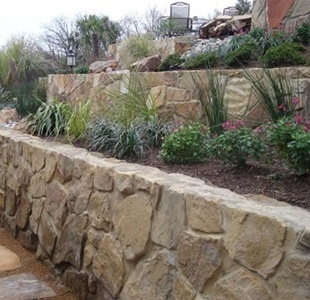 Below are some great landscaping stone wall ideas for your garden. 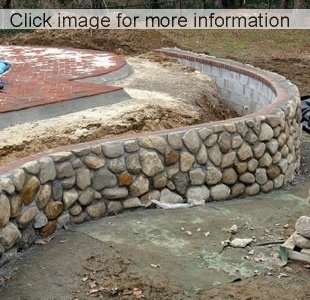 This rounded river stone wall is a decorative cladding in front of the curved concrete reinforced masonry block retaining wall. This stone wall costs far more than a gabion stone wall as it requires an extra strong foundation to allow for both the weight of the stone cladding and the concrete blocks. The architect has combined with the engineer to design wall that is both structural and aesthetic for this garden stone wall design. 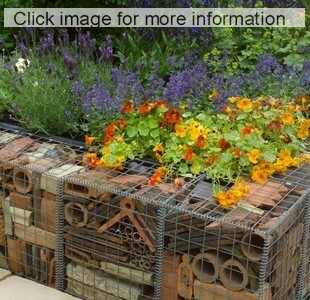 This is a great idea for a garden stone wall. 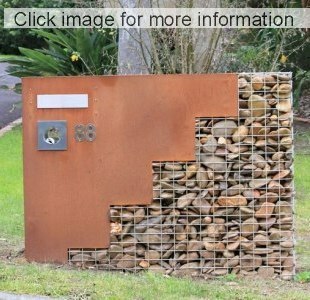 The use of corten steel in a landscape stone wall give a fantastic visual contrast to this letter box. 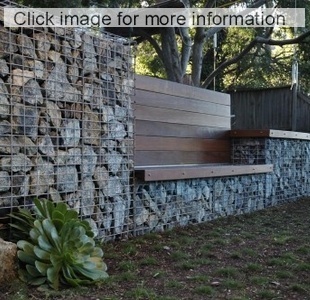 That design's clean lines and simplicity are part of what makes this gabion stone wall so effective. By combining raw sand stone uncut blocks, with cut stone, the builder of these stone walls has brought together two earthy elements. This landscape design sometimes requires an experienced stone mason, that can build a stone wall like this and some careful planning. Mortared stone retaining walls, need to built on an reinforced concrete footing, as the wall itself has no steel reinforcing inside it, to hold it together It may not be possible to build a mortared stone wall on poor load bearing organic soils such as peat. A first class drainage system required behind this type of stone wall, to prevent hydrostatic pressure damaging and cracking the stone wall. These stone walls are very decorative in the garden, with this construction method you can also build curved stone walls. 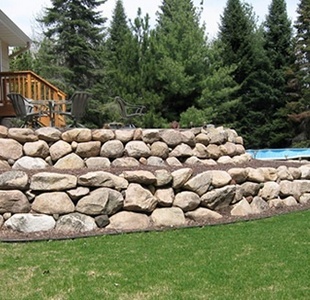 Designed to hold back soil, this retaining wall employs big stones or boulders that were moved into position with heavy equipment and because of the lifting equipment needed these are not really a DIY stone walls. Despite the size of the stones, the builder has delicately sloped the curved stone wall to help resist outward soil pressure. 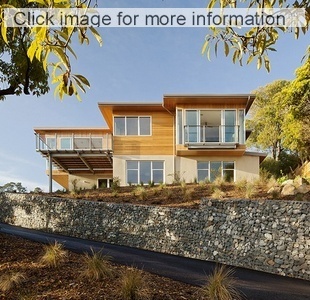 The design of all stone walls needs to consider, the soil profile, soil type, (clay, gravel or sand). Stone walls are heavy, and apart from gabion stone walls, nearly all other types of garden stone walls need a reinforced concrete foundation. Site access, the look of the stone wall, material and labour costs, all influence the final stone wall cost. 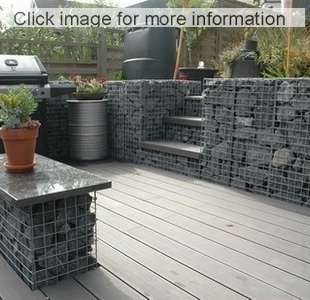 Larger decoartive landscape stones and boulders can be quite expensive per tonne, gabions are able to use cheaper stones thereby reducing the stone wall cost. Home owners, weekend builders, and diy specialists can build most gabion stone walls depending on size over several weekends. 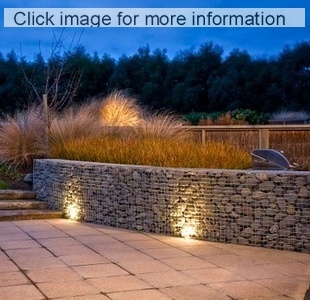 For larger gabion stone walls or curved stone walls, you can get a quotes from, local landscapers, small earthworks contractors and specialist stone masons, who have both the machinery and experience to build the larger curved stone walls quickly for you. 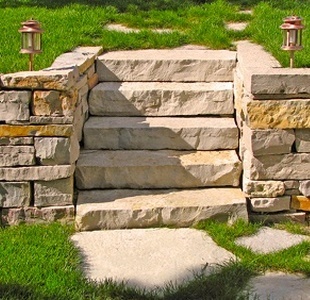 Experienced contractors can also assist with the stone wall design ideas needed for your garden project.